Home > Publications > FactCheck: do Australian banks have double the return on equity of banks in other developed economies? FactCheck: do Australian banks have double the return on equity of banks in other developed economies? In its 2017 federal budget, the Australian government included a 0.06% levy on Australia’s biggest five banks: ANZ, the Commonwealth, NAB, Westpac and Macquarie Bank. The levy will collectively cost the banks A$1.6 billion a year, and by some estimates will raise the overall cost of funding for the affected banks by around 0.03%. Many commentators have suggested this cost will be passed directly onto customers. In an interview on the ABC’s Insiders program, Treasurer Scott Morrison said the banks could absorb the cost of the levy, given the size of their profits. 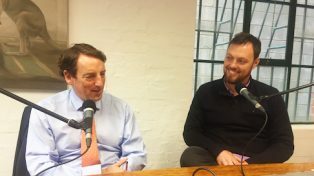 He said Australia’s large banks have between a 0.2% to 0.4% advantage because of the way Australia’s regulatory regime works and that Australian banks have a return on equity about twice that of banks in other advanced developed economies. When asked for sources to support his statement, a spokesperson for Scott Morrison referred The Conversation to evidence presented by the Reserve Bank of Australia to the House of Representatives Standing Committee on Economics at its hearing on September 28, 2016. In the report, the Reserve Bank included a chart provided below. What is the return on equity for Australian banks? Return on equity, or ROE, is a measure of profit, expressed as a percentage of shareholder equity. It shows how much profit a company generates with the funds invested by its shareholders. The figure below (from the Reserve Bank’s Financial Stability Review) shows the return on equity of the large banks in Australia was around 15% in 2015. Including the smaller Australian banks, which have about 20% of the market, the average return on equity is somewhat lower and more variable than for the big four only, but it is above 12%. Financial Stability Review April 2016, Reserve Bank of Australia, page 12. A decade ago, Australian bank returns on equity were a few points higher, and not much different from those earned by banks in other developed markets. However, during the global financial crisis, banks in the US and Europe sustained large losses, leading to negative returns for couple of years. US banks have since recovered somewhat. European and UK banks, however, continue to perform weakly: the returns on equity of large banks in Europe are about 5%, compared to about 3% in the UK. The ROEs of large Canadian banks have, like those of large Australian banks, remained higher and more stable. Do Australia’s biggest banks have an added advantage over smaller rivals? The treasurer also claimed that “our major banks have about a 20 to 40 basis point [funding cost] advantage because of the nature of the regulation and structure of our financial system”. Big banks do indeed appear to be able to borrow more cheaply because their lenders expect them to receive government support during crises. In 2010, the International Monetary Fund (IMF) used a range of approaches to estimate the value of “implicit government support” – such as the bailouts provided to some US banks during the global financial crisis – for banks and other financial institutions in the Group of 20 nations, including Australia. While the answers from the different approaches varied, the IMF concluded that implicit government support “provides too big to fail financial institutions with a funding benefit between 10 and 50 basis points, with an average of about 20 basis points”. Here in Australia, the Reserve Bank has concluded that “the major banks have received an unexplained funding advantage over smaller Australian banks of around 20 to 40 basis points on average since 2000”. Macquarie University researchers James Cummings and Yilian Guo found that the funding cost advantage was about 30 basis points from 2004 to 2013, but has declined to about 16 to 17 basis points since then, in part due to prudential reforms that obliged banks to increase the share of lending contributed by shareholders. 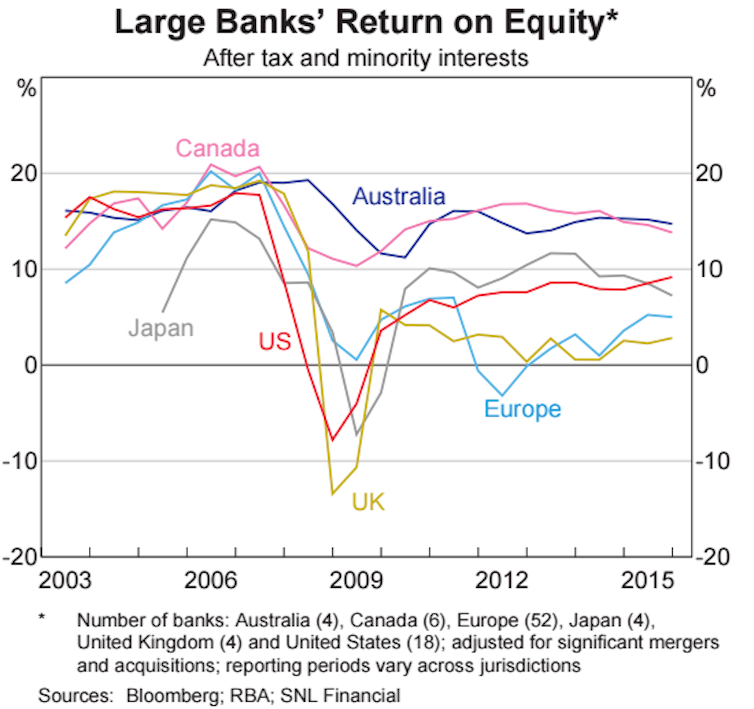 Scott Morrison was correct: Australian banks do “have a return on equity which is about twice, if not more than that, what you see particularly in other parts of the advanced developed economies of the world”. Australian banks currently have higher returns on equity than banks in many other major developed markets. Those returns are about twice as high or more than the returns of the troubled European and UK banks. But returns in Canada are close to the Australian level, and the returns earned by large US banks are only a few points below the Australian level. The treasurer is also correct to point out that the major banks enjoy a funding cost advantage on the basis of expected government support in financial crises. However, the size of the support is less clear. While IMF and RBA studies are in line with the treasurer’s range, there is some evidence that the funding cost advantage may now be somewhat lower.